“92-8, which is a pretty good tally,” said Murkowski, chair of the Energy and Natural Resources committee. The bill is an amalgamation of more than 100 bills, requested by 50 senators. Many provisions deal with local issues in Western states, like changing the boundaries of a federal refuge or allowing access to public lands. But the bill creates or extends national programs, too. On the Senate floor before the vote, Murkowski listed some of the specifics. Creating national monuments is often controversial (particularly when a president does it) but Murkowski negotiated this package with Senate Democrats and with House members of both parties, weeding out the deal-breakers and the poison pills. One of the bigger Alaska-specific items is a re-opening of the Native allotment program for veterans of the Vietnam War era. That 1906 program gave Native individuals title to 160-acre allotments, often where they hunted or fished. The program ended in 1971, with passage of the Alaska Native Claims Settlement Act. 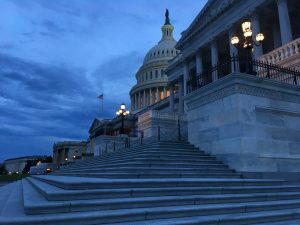 But Alaska’s congressional delegation has repeatedly tried to extend it for veterans who may have missed the opportunity to apply because they were serving in the military. The latest extension, pressed by Sen. Dan Sullivan, eliminates the requirement that applicants show they’ve got a personal connection to the land they pick. Veterans, or their heirs, can apply for land in any region of the state, though Democrats insisted that National Forests, refuges and other protected areas aren’t eligible for selection. The provision could allow as many as 2,800 veterans to apply for an allotment, though Murkowski said the actual number could be substantially lower. The public lands bill goes next to the House. Its chances there are improved because Murkowski and the top Democrats on her committee already negotiated the details with their House counterparts.